Entertaining and educational… Based on +46 years of hands-on experience using stories to nurture creativity and develop a flawless, natural grasp of the English language. Immediate online access… Your family can start enjoying our professionally narrated and vividly illustrated tales right away – no waiting! Preserve values and traditions… Our collection provides an enjoyable and engaging way for children to learn about new facets of their culture. 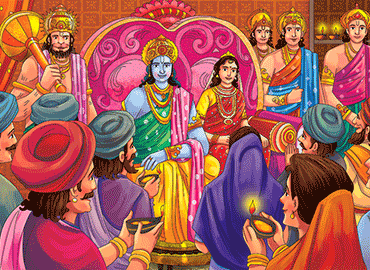 A Diwali Story: Rama and Sita Defeat Ravana, the Demon King…. Diwali is one of the most widely celebrated festivals, in India and around the world. It is a joyous Festival of Lights when families unite on the darkest night of the year to light candles, set off fireworks, give gifts, and celebrate together the victory of light over darkness. Many wonderful tales of the Gods and Goddesses – Ganesha, Lakshmi, and Krishna – are told during Diwali. We are going to tell you one of our favourite stories. Click to watch. The story about King Ambarisha and the Holy Sage Durvasa…. One day long, long ago there lived a mighty king named Ambarisha. He was strong and powerful and he, and his beautiful Queen Shrimathi, were devoted to truth and justice. Their subjects loved them, and all were happy under their wise rule. Their palace was large and beautifully decorated… Click to watch. The Tale of the Lion and the Crane…. The Buddha was a great and holy man who was born on earth as a Prince. But he gave away his Kingdom in order to travel the earth teaching men and women the path to freedom and peace. He told many wonderful stories to help people understand how to live a happy and peaceful life, and to find a pathway to God… Click to watch. Storytelling has been proven to help children develop emotionally and creatively.Our philosophy is based on over 46 years of hands-on experience using stories to nurture creativity and develop a flawless, natural grasp of the English language. Expanding their cultural understanding at an early age develops an appreciation that lasts a lifetime. Studies show that electronic devices can be of educational value for children, but discernment is needed regarding the content. These stories give children the best content using the most modern equipment. When children listen to great stories it nurtures a sense of awe and wonder in the world around them. It relaxes and calms them too; important in their fast paced busy lives. Sharing the Ancient Indian Wisdom with today’s children is a gift that lasts a lifetime. Enjoy these beautiful stories with them today.